Several useful report templates specific to Causeview users are created and available for you to use in the “CauseView Reports 2.0” report folder. These reports are designed to meet some of the more common reporting needs for non-profit organizations, and will draw on the information your organization has saved in Causeview. All reporting functions in Causeview are found under the “Reports” tab. Remember that if you don’t see a tab at the top of Causeview, it may be under the “+” tab or the down arrow for overflowing tabs. 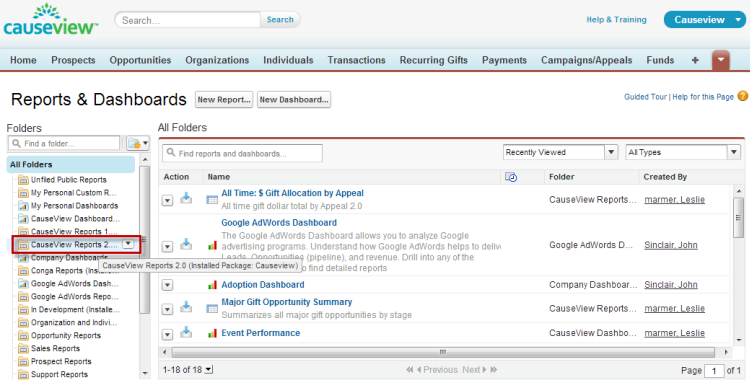 Inside the Reports tab you will see a list of report folders and a list of reports and dashboards found in all folders. The default list is recently viewed reports and dashboards. If you have recently used the report you would like to run you can click on it in the list of reports. 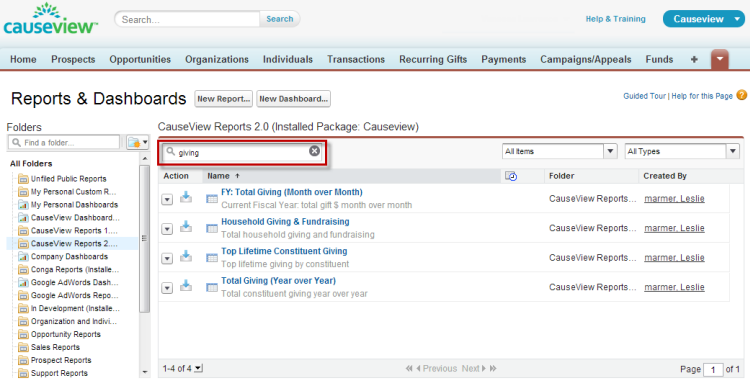 Reports designed specifically for Causeview users are found in the “Causeview Reports 2.0” folder. If you are looking for a new report template or would like to browse through the available reports, you can open the folder by clicking on it in the list of folders on the left. The available reports will be organized alphabetically by report name, and all of the reports in the folder will show by default. Choosing the report that best suits your needs may require some trial and error, depending on what information you would like to view. 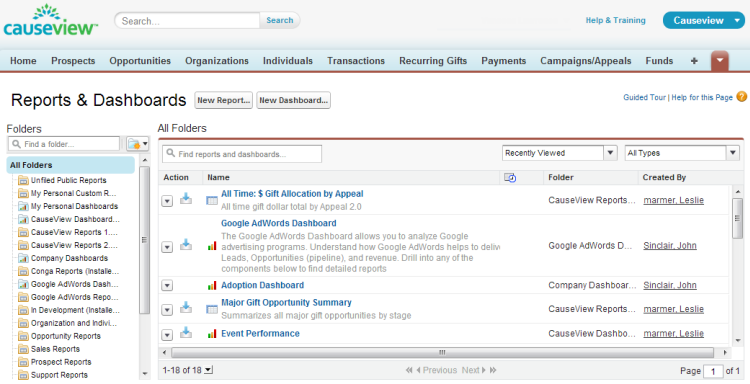 You can search for keywords in the report title or description using the report search function. Some reports will automatically generate an associated graphical chart, while others will simply display consolidated information in a table. If you would like to preview, adjust, or customize a report you can click on the report title to run the report. If you know that a report has all of the information you need, you can export it in .csv or .xls format directly using the Action arrow. To open and run a report from the Causeview Reports 2.0 folder, simply click on the report name in the list of available reports. The report will pull information you have saved in Causeview, run any necessary calculations, and display the preset tables and charts. In the report view you will have several options to adjust the report. The contents of the report can be changed using several different drop-down menus. The central report options will specify what information the report conveys through the “Show” option - in this case the report is showing all allocation values. The “Summarize information by” menu changes how the allocation values are grouped. In this report the allocation amounts are grouped by the name of the allocated appeal. The “Time Frame” section of the report allows you to adjust what date range the report draws from. In the “Date Field” you can specify what date is important for the report - in this case the allocation date is important, rather than transaction, payment, or allocation creation date. The date “Range” can be set to one of many preset options related to the fiscal or calendar year, the financial quarter, months, weeks, or a specific number of days preceding or following the current date. The custom date range allows you to specify a start and end date for the report. If a custom range is selected with blank “From” and “To” fields, all Causeview information will be used. The filtering options, at the bottom of the report page, allow you to select specific line items from the report table, using check boxes, and filter the report. For example, in this report you could select specific appeals you are interested in and choose to filter the results by gift type and click “Drill Down”, to see the total allocated amount by gift type in only those appeals. If you check off several boxes and click “Drill Down” without selecting a field, the report will simply filter out any items that you did not select. The report can also be changed using the “Show Details” button, which will simply expand the report to include more detailed information. If the report and chart originally display summarized information, like total allocation amounts, showing details will reveal a list of all allocations contributing to those totals. The details will show up in the table, but not the chart. If you would like to customize the report further than these options allow, you can use the “Customize” button at the top of the report. Buttons allowing you to save, export, and print a report appear at the top of the report view page. The “Save” button allows you to save any changes you have made over the report template in the report folder. The “Save As” button allows you to save your report under a new name. The “Delete” button will delete the report template you began working from, along with any changes you have made. The “Printable View” button will download an excel file containing a printable version of the report table, as it exists in the report you are viewing. It will not include any graphic charts, but the file will be formatted to match the appearance of the report table. The “Export Details” button will allow you to download the detailed information that contributes to the report. Even if your report features only summary information of allocations, the exported details will include all contributing allocation items. The exported file can contain a very large amount of data. Both comma delimited (.csv) and excel (.xls) files are available.